Welcome to stay in the beautiful inland of south west Sweden! 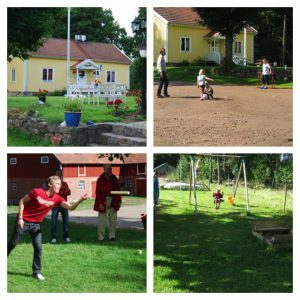 At Sotanäs you will have access to the garden and a small playground, with swings and a sandbox. We gladly lend out grille, and there are social games such as croquet available. You can play table tennis in the loft of the barn (rackets can be borrowed). In the house you live in, which we call Huldas, you will have board games, television, newspapers and books at your disposal. The road down to the lake pass small fields and mixed forest along the lake, and is a short pleasant walk. More routes are available. 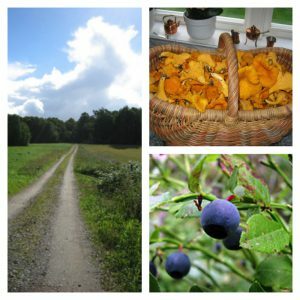 In the late summer and autumn there are plenty of berry and mushroom to pick. Would you like to ride your bicycle, we will be happy to help you plan a proper tour. 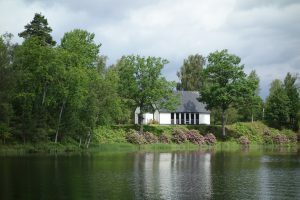 You can, for example cycling to Fegen, follow the cycle path to Ätran, on to Gunnarps and then back again on small roads through a landscape with a mixture of forest and farmland. Click here for a map. 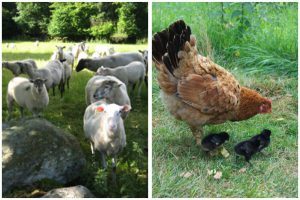 The farm has sheep, chickens, cats and a dog called Max. You are welcome to visit them. 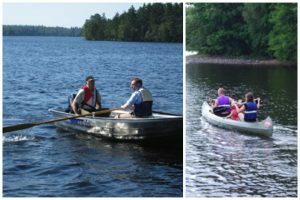 Rowing boat with or without a motor can be rented from us. Would you like to rent a canoe, please contact us for more information. Fegen lake offers good fishing for perch, pike and walleye. Fegen is also known for jig-fishing for burbot in the winter. More information and ability to buy fishing permits is available on Fegens fish association’s website . At Sotnäs is a natural sandy beach, within walking distance from the farm. Midway between Fegen and Sotanäs is also a public beach. Visit the Chapel of Fegen, 3 km from Sotanäs. 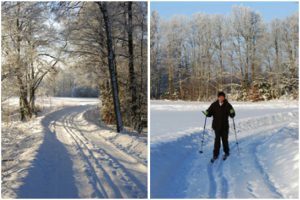 In winter there is often an opportunity to cross-country skiing on forest roads or the lake. Contact us for current information. Prepared tracks are available in Ätran (10 km) and in Åkulla (40 km). Fegenkiosken Canoes and boat rental. Gas station, shop, mini-golf, Café. Located in Fegen. Ekomuseum nedre Ätradalen Information on nature and history of Halland and places of interest. Fegens fiskevårdsområdesförening General information about fishing in lake Fegen and how to buy a fishing licence. Ugglebo Wärdshus Restaurant in Fegen serving lunch, a la carte and take-away.